From the legal to the regulatory, April has had its fair share of coal ash updates affecting both Allen (Lake Wylie) and Marshall (Lake Norman). More action items loom on the horizon. We remain in court to secure cleanups at Allen and Marshall, just as we did for Riverbend (Mountain Island Lake) and Wateree (Wateree River). We have continued to file legal challenges to permits and other aspects of coal ash regulation to help ensure we get the protections we need. Most disappointing has been the unwillingness of the North Carolina Department of Environmental Quality (DEQ) to hold Duke Energy accountable and to require a cleanup of decades of piled-up, leaking contamination. Thank you to everyone who has submitted comments when decisions have been open for public comment; it does make a difference, and we’ll need you more than ever as the year progresses! This applied to seepage at Allen, Marshall and Cliffside (on the Broad River). North Carolina’s Environmental Management Commission (EMC) signed off on the SOC with minimal changes, just increasing the fine to $156,000. This was extremely disappointing for a variety of reasons, including that — despite bringing attention to the matter — the monitoring requirements failed to include multiple elements we have seen occur at high levels in coal ash. The finalized SOC also omits multiple seeps and provides too many opportunities for Duke to not be held accountable. Read our detailed write-up and comments here. The National Pollutant Discharge Elimination System (NPDES) permit for Marshall is an issue we had passionately litigated with SELC for more than a year. The draft permit had countless issues and inadequacies, including attempting to allow Duke to call a creek a wastewater effluent channel and to draw a compliance boundary out in Lake Norman. While Marshall’s seepage had contaminated that creek and groundwater, the creek is still a natural creek subject to protections, and Lake Norman does not exist to allow Duke to dilute its problem into compliance. We had a legal victory after we challenged and got removed the most egregious language. But in the end, the permit still has mostly blanks instead of numbers where discharge limits should be listed for contaminants. This means Duke only has to monitor and report for these elements. 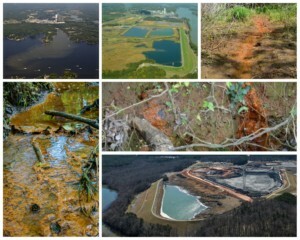 There are multiple contaminants we know to be a problem with coal ash that Duke does not even have to monitor/report. Read our detailed write-up and comments here. Marshall’s discharge permit was only the first to be renewed. Allen’s also needs to be renewed, and we hope DEQ can learn from mistakes it allowed to persist int he Marshall permit. Stay tuned as we review more of the Allen permit and discuss comment submission. The coal ash situation isn’t much better at the federal level. At least 2015’s Coal Combustion Residuals (CCR) rule issued by the EPA was a start. However, the current administration is looking to roll back even the most basic monitoring requirements issued in 2015. Public comment closes April 30. Visit the Waterkeeper Alliance page here to learn more about the issue and how to comment. The federal CCR rule provides the option for states to implement their own, federally approved permitting program for coal ash rather than have the states run coal ash regulation through existing water quality and waste management programs. We reviewed the 90 pages of draft program language and have a lot of concerns with a very understaffed DEQ creating a whole new program. We expressed those concerns at two public hearings on the matter. There is no specific time table for a decision to be made on this, but stay tuned.